With just under a month remaining until Marksmen Training Camp, we’re starting to see exactly what kind of roster will be participating in the camp, with a lot of veteran experience or talented newcomers. Tim Kielich, a left-handed forward hailing from East Aurora, New York fits into the latter category, after a three-year stint at SUNY-Brockport (NCAA DIII). 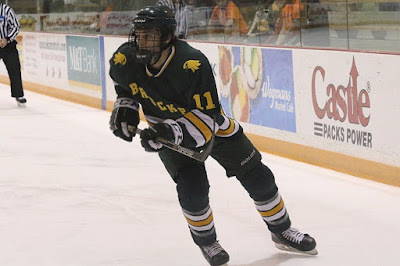 Kielich, 6’0 and 185 pounds, found the puck plenty during his days as a Golden Eagle, averaging nearly a point-per game with 76 points (21G+55A) in 77 games played. Prior to his college days, Kielich like many new-Marksmen, spent his junior hockey career in the OHJL’s Buffalo Jr. Sabres organization. During his four-years in Western New York, Kielich had no problem finding points, as he racked up 133 (56G+77A) in 235 games played. During those four years, he scored under thirty points in just one season. As well with the OHJL connection, Kielich shares the commonality of having a couple ECHL games under his belt before coming to the Marksmen Camp, as kept inside The Empire State in heading to the Adirondack Thunder for two games after his college season. Kielich spoke highly of the new opportunity in Fayetteville. Head Coach Jesse Kallechy expressed great interest in seeing what Kielich can bring to the roster. With 38 days remaining until the SPHL season begins, the anticipation is starting to reach a fever pitch, especially as the Marksmen Camp roster starts to finalize, and the team’s exhibition against Macon has been set for October 12. The Fayetteville Marksmen are excited to welcome Tim Kielich to his new home for the 2018-19 season, and look forward to him being the bedrock of what promises to be an exciting season of hockey in the Cape Fear. The 2018-19 Marksmen Home Opener is October 19th against the Roanoke Rail Yard Dawgs, and Season Tickets are on sale NOW!